May 1941. 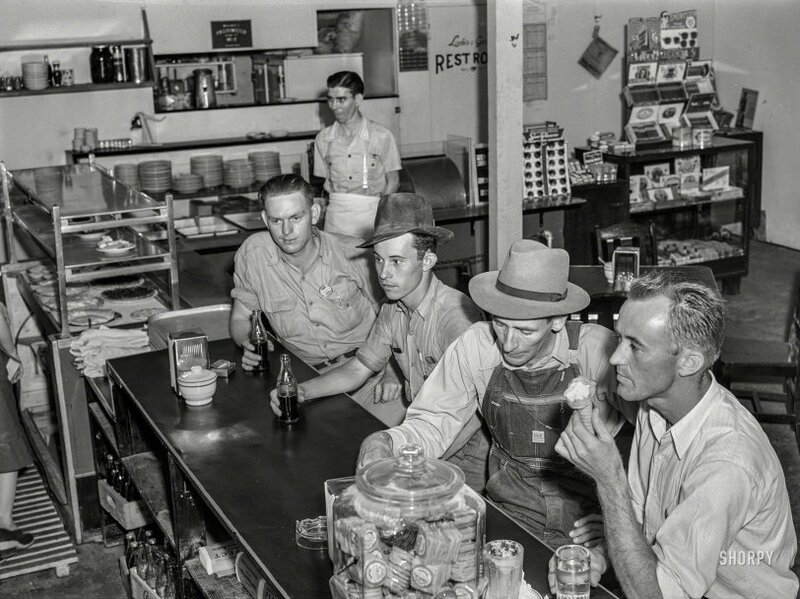 "Workmen from the nearby Dupont powder plant in a cafe in Childersburg, Alabama." Acetate negative by Jack Delano. View full size. Submitted by Gooberpea on Fri, 02/08/2019 - 10:16am. Imagine how busy these guys will be in seven months. I imagine prewar production of gunpowder was already high by May, 1941, but much less than demand after 12/7/41. 1. Somebody tell the guy at the far end of the counter - NO SMOKING in a gunpowder factory! I suppose they couldn't even take a book of matches into the factory. 2. I have the same sugar bowl as the one on the counter next to the napkins. Green stripes. Very heavy - commercial "diner ware". I picked it up at a junk shop a long time ago - we use it as a salt cellar to hold that fancy pink cooking salt on the stove. It just tastes saltier, amiright? 3. I also had several pairs (may still have some) of the round, clip-on sunglasses from my bohemian, fashion-backwards, pre-wife, junk-shop phase. I think I bought a whole card of them at an entirely different junk shop. I gave some away, broke the clips on others. I used to wear them on prescription glasses that weren't quite the same shape. Looked extremely goofy, I'm told. Wife fixed the fashion goofy; ophthalmologist fixed my eyes. I'm in a better place. P.S. I received a very nice postcard from Team Shorpy this week thanking me for my Patreon contribution. I encourage all of you who derive pleasure from noodling through these photographs to chip in what you can to keep the site going. Easy to do. Link on the left side of the home page. Submitted by Solo on Thu, 02/07/2019 - 2:06pm. Or several, actually. Adjacent to the register are displays of cigars, sunglasses, and other impulse items geared to extract that extra bit of cash from the pockets of men whose wages after a long depression must seem unbelievably ample to them. "Hey, Bob! Grab me a packet of Sen-Sens, would ya? I've got a hot date tonight with Bertha from Accounting." Submitted by Railsplitter on Wed, 02/06/2019 - 12:43pm. I used to work with a man who worked at a DuPont smokeless powder plant (later to be tapped by DuPont to go work at a super secret facility making slightly more explosive stuff; namely, plutonium). He said that DuPont was so strict about safety that everyone was searched for matches or lighters every day before entering the plant. You got one warning if you were caught with anything that could produce a flame. If it happened again, you were fired on the spot. Submitted by Quatermass on Wed, 02/06/2019 - 12:33pm. Peter Fonda appears to be enjoying his cone. Submitted by jimmylee42 on Wed, 02/06/2019 - 12:03pm. I bet in 1941 Coke and Lucky Strike were the No. 1 smoke and drink combo enjoyed by men and women alike. If that is a Lucky Strike pack on the counter, in 1942 it would be white in color, as Lucky Strike green went to war. Submitted by Dbell on Wed, 02/06/2019 - 10:34am. A few years later, my dad was in the South Pacific, building airstrips. One afternoon, a sailor came into camp from the jungle, carrying a nice string of fish. Dad asked him, "What bait did you use?" Reply, in a southern drawl, "Dupont!" Submitted by DaveA on Wed, 02/06/2019 - 10:31am. Pack of smokes, a Coke, rack of sunglasses on offer and grab a box of cigars. Plus an ice cream cone. What more does one really need in Childersburg, Alabama? Submitted by DonT on Wed, 02/06/2019 - 10:03am. My father worked in that powder plant during WWII. I still have his W-2 forms for that time. Said it was extremely hot work, since they had to wear woolen outerwear to keep the powder off their skin. Henry Fonda - front right! Submitted by Miniaturist on Wed, 02/06/2019 - 8:37am. It’s not often that a photographer serendipitously captures a movie legend, like Henry Fonda, while taking “man on the street” photos. And if you say “That’s not Henry Fonda,” I will say, how do you know ... were you there? Submitted by AleHouseMug on Wed, 02/06/2019 - 7:04am. Are empty bottles ready to be returned and refilled, proving that you an get a round peg in a square hole. Submitted by memex_pl on Wed, 02/06/2019 - 2:57am. In my country (Poland) in the early 1950s, official communist propaganda tweeted that coca cola dissolves human brains. Submitted by DMI57 on Tue, 02/05/2019 - 5:29pm. ... that this is The Dinette? Submitted by AAAndrew on Tue, 02/05/2019 - 3:39pm. Looks like six or seven different kinds of pie, and a bunch of different cigars on the display in the back. Don't know my cigar boxes, but I bet there's someone out there who can. Submitted by Root 66 on Tue, 02/05/2019 - 3:23pm. I'm with the guy on the right--he's having an ice cream break! Better yet, put that ice cream in your Coke and have a Coke float! Submitted by pennsylvaniaproud on Tue, 02/05/2019 - 2:59pm. Eating the ice cream cone. It's a two scoop cone. Our little ice cream shop in the 50's would place a slice of Neapolitan ice cream in the cone and call it a skyscraper. 10 cents a cone.